Posted August 17th, 2012 by Yvonne Hawkey & filed under Nagra. 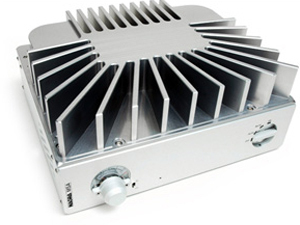 This really is a compact little powerhouse of an amplifier, the team at Nagra have managed to produce a MOSFET design of sublime musicality and finesse. The machining of the casework alone is a superb piece of industrial design. Typically Nagra in the manner of which it just goes about its job, letting the music do the talking and taking nothing away from it. If the 300 power amp is a bit too daunting for you then simply partner the MSA with the Jazz preamp and youâ€™ll have the most wonderful (space friendly) combination imaginable.